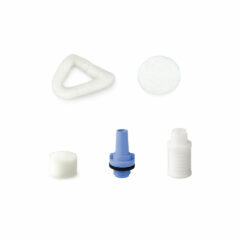 Salin Filter Replacement Cartridge for the small Salin Salt Therapy Device. This filter cannot be used with the (regular sized) Salin Plus™ device. Not available in pharmacies. The Salin Filter Cartridge contains 100% natural purified rock salt, rich in vital minerals, allowing you to carry out your ‘salt room therapy’ at home. The ingredients include over 98% sodium chloride, with the trace elements calcium chloride, magnesium and iodine. This Filter Cartridge is for the small Salin Salt Therapy Device only.